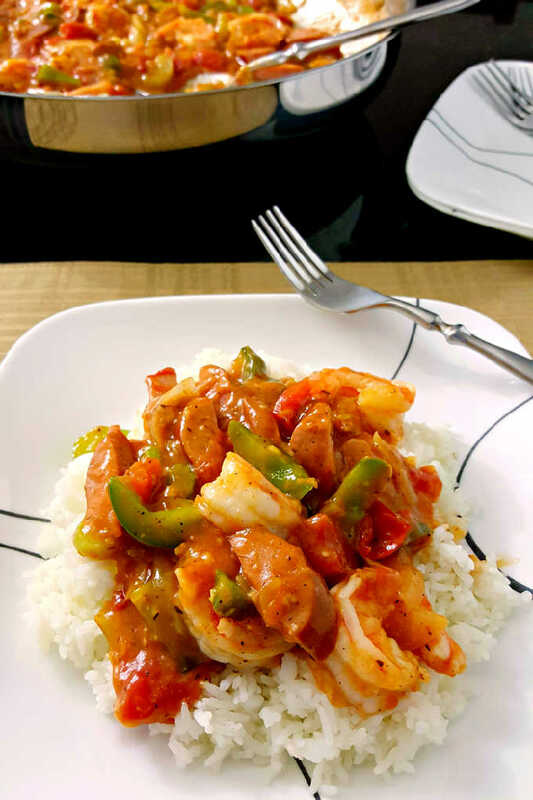 Tender shrimp are sautéed with kielbasa and vegetables and served up like a stir-fry with a delicious sauce and fragrant rice. 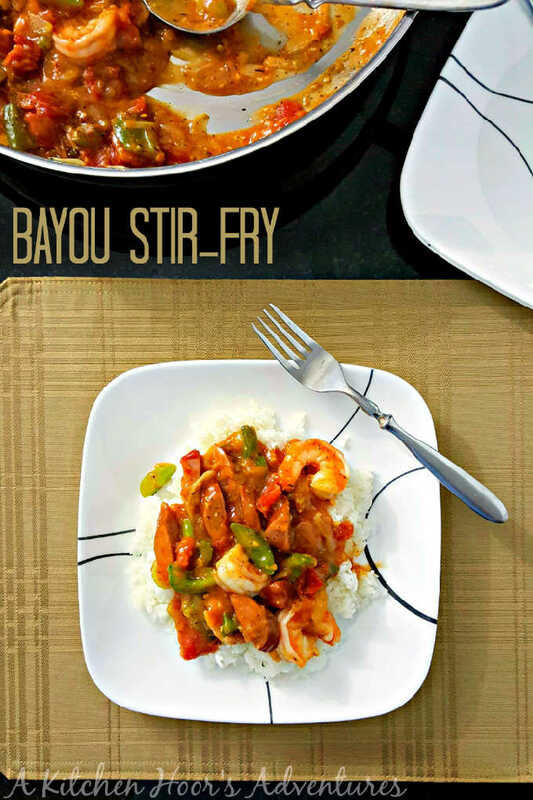 Bayou Stir-Fry has Cajun spice with a rich stir-fry style sauce. I love Cajun flavors. Seriously. We’ve been blackening since before blackening was a thing. We had a recipe for Cajun seasoning before it was popular. I’m talking, way before Emeril (LOVE HIM! ), way before Paul Prudhomme, and WAY before Tony Chachere’s. Honestly. This is all thanks to Dad’s many trips to New Orleans for work and all those Justin Wilson shows that truly sparked our interest. With him being such a foodie (Hello? Where do you think I get it? ), he made friends with a guy down there. I’m not sure if he was chef or just a foodie like him, but this dude gave him an age old recipe for Cajun/blackened seasoning. We blackened food before it was a thing. And, well, with my wimpy palette during the teenage years, Dad never really made it very spicy. But it was spicy enough that we all got the point of the seasoning. It was downright delicious! And that, my dear readers, is how the interest in Cajun seasoning began. And, well, most things Cajun or New Orleans. Like these delicious baked beignets I made. This Cajun pasta, THIS Cajun pasta, and these kabobs. Heck, we even use Cajun seasoning in our breakfast scramble that we make. So, to say that we love Cajun seasoning is an understatement. It’s prominent on our spice shelf and a go to blend for a lot of our recipes. But this? This stir-fry has amazing Cajun flavor. It truly does capture the Cajun seasoning with the trinity of peppers, onions, and celery. 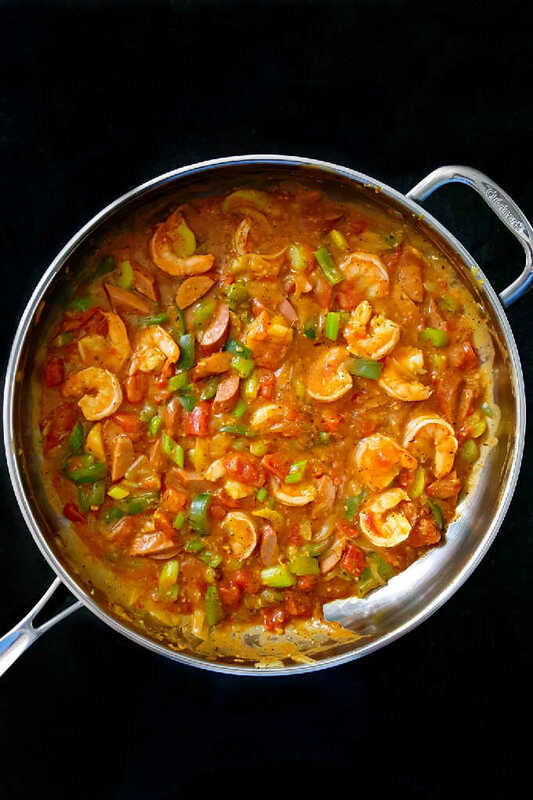 Then there’s the combination of sausage and shrimp; just like in a gumbo. There’s a delicious sauce that wraps all the vegetables, sausage, and shrimp together in a nice little package. All this is poured over some aromatic basmati rice. Sorry. I’m just drooling a little bit. But who wouldn’t? Honestly? Just look at all those colors, that sauce, those flecks of spices. Mmmm. We ate this and licked the plate. Oh, and did I mention that this dish was done in under 30? Even if you don’t have a rice cooker? If you start the rice right when you get home, it only takes about 20 minutes to cook. Veggies took about 5 minutes to chop up, then sauté to your heart’s contact. There’s truly no excuse to NOT make this for dinner any night of the week. 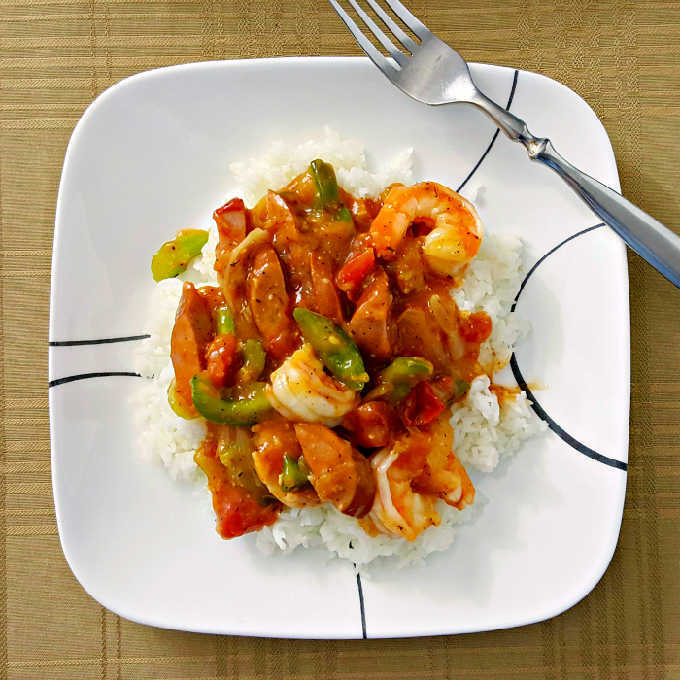 When did you first get introduced to Cajun food? Do you have your own recipe for blacken/Cajun seasoning? In a large skillet coated with cooking spray, sauté the onions, peppers, celery, and kielbasa for 4 to 5 minutes. While the vegetables are cooking, combine the chicken stock with the cornstarch, Cajun seasoning, thyme, and crushed red pepper. Place the shrimp in the pan and cook 1 to 2 minutes before pouring the broth mixture over them. Simmer, stirring occasionally, 3 to 5 minutes or until the sauce is thickened and the shrimp are cooked through. Place one cup of rice on each of four plates. Top with the stir-fry mixture and serve. I love Cajun flavors as well Christie–I am sure to enjoy this one! Love your food memories with your father. New Orleans is a foodie’s paradise. Thank you! I hope to get there one day. I love this type of spicy comfort food served over rice! Tasty! This looks mouthwatering amazing!! A must try for me! Thank you, Cathy! I hope you enjoy it!